A-HOTEL.com - Luxury and cheap accommodation in Mamedova Shchel', Russia. Prices and hotel, apartment booking in Mamedova Shchel' and surrounding. This indicative offer was derived from the most recently booked accommodation in Mamedova Shchel' and sort by the price, from cheapest Mamedova Shchel' accommodation to the most expensive hotels. To select accommodation by your preferences we recommend to choose from 2 accommodation offers in Mamedova Shchel' in total. By entering the dates of your overnight stay in Mamedova Shchel' and using the filter tools you can sort the best possible accommodation for you. The entered dates of your stay are crucial for the most accurate offer as it derives all the online information on pricing and availability of Mamedova Shchel' accommodation. Then you can book the selected Mamedova Shchel' lodging (hotels, apartments etc.) immediately. Situated in Mamedova Shchel', Platonov provides water sports facilities. Among the various facilities of this property are barbecue facilities, a terrace and a bar. Boasting a garden and free WiFi, Наталья is situated in Mamedova Shchel'. Guests can make use of a terrace. Situated in Lazarevskoye, 3 km from Aqua Park Sea Star, Guest House Solnechny Pik has water sports facilities and a terrace. 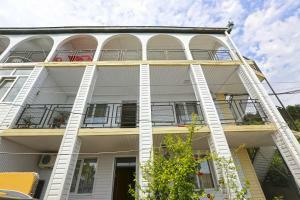 The property is around 5 km from Amusement Park and 5 km from Aqua Park Nautilus. мини-гостевой дом "Aura" features rooms in Lazarevskoye. 3 km from Aqua Park Sea Star, the property is also 5 km away from Amusement Park. Featuring barbecue facilities, a garden as well as a terrace, Holiday home on Sedova 36 is situated in Lazarevskoye, 2.9 km from Aqua Park Sea Star. Guest House Valentina offers accommodation in Lazarevskoye. Guests can enjoy the on-site restaurant. Featuring barbecue facilities, Guest house Good House is situated in Lazarevskoye. Among the various facilities are a garden and a terrace. Located in Lazarevskoye, Magas offers a garden. Featuring a 24-hour front desk, this property also provides guests with a terrace. Hotel Iceberg is situated in Lazarevskoye, 2.5 km from Aqua Park Sea Star, and has a seasonal outdoor swimming pool. 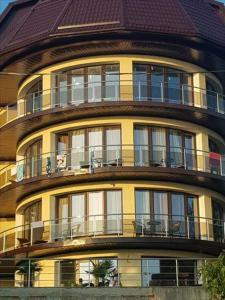 Located 2.5 km from Aqua Park Sea Star, Kiparizzz in Lazarevskoye offers a terrace. Offering an outdoor pool, Hotel Priboy 2 is located in Lazarevskoye, just 100 metres from the Black Sea coast. Free WiFi access is available. Boasting a garden, terrace and free WiFi, Visoky Zamok Guest House is located in Lazarevskoye, 2.4 km from Aqua Park Sea Star. Situated within 2.4 km of Aqua Park Sea Star and 4. Set in Ashe, Guest house Magnolia features accommodation with private balconies. The property features barbecue facilities, as well as a terrace. Located 2.1 km from Aqua Park Sea Star and featuring a terrace and free WiFi, Amvel provides accommodation in Lazarevskoye. 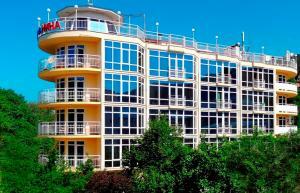 Novikoff Hotel is located in Lazarevskoye, 1.4 km from Aqua Park Sea Star . Located within 1.9 km of Aqua Park Sea Star, Guest House Lyudmila in Lazarevskoye features a number of amenities including barbecue facilities and a terrace. Located on the beachfront in Lazarevskoye, Villa Nina has a bar. Located around 1. Guest House on Pobedy 268 is set in Lazarevskoye. The property is located 1. Set on the beachfront in Lazarevskoye, Guest house Viktoria features a terrace. 1.